With the Winkelfix range, the measurement of angles is performed quickly, precisely and with the utmost ease. Simply place the Winkelfix in position rotate the arms into position and the angle will then be accurately shown in degrees in the analog display. The two built in spirit levels permit the instrument to be held in the true horizontal or vertical position for any measurement between 0 - 180º in 1º increments. Thanks to reliability, sturdiness and convenience, the winkelfix which is available in three different sizes has proved its value in the building industry over and over again. Quickly measures angles of bay windows. Accurately measure any angle present within a property. Robust horizontal and vertical spirit levels ensure precise positioning. 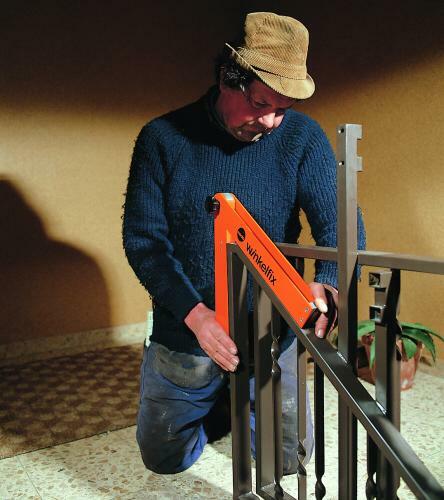 With the Winkelfix Classic, the measurement of angles is performed quickly, precisely and with the utmost ease. Simply place the Winkelfix in position rotate the arms into position and the angle will then be accurately shown in degrees in the display.